Combination of medium grey tones. Natural stone veneer is a versatile material that can work equally well looking rugged and rustic or sleekly modern – depending on how and where it is applied. Our Moonlight Basin Ledge Stone is a perfect example. With its combination of medium grey tones this elegant product makes a strong linear statement, both inside and out of the home. Its profile is a traditional ledge stone rectangular shape and the stones range from 2" to 8" face heights and 3" to 18" lengths. Used on exterior elevations, Moonlight Basin Ledge Stone will add charm and sophistication to half walls and eaves. It can be used to create a harmonious flow between unrelated areas, a garage and main building for example. It can enhance the visual impression of a front entrance by applying it around doors and on porch columns and porticoes. This stone veneer harmonizes with many trim and exterior materials and can be further refined with complementary wainscot sill pieces, 90-degree cut corners and capstones. Around the property, this product can anchor a landscaping design to create different outdoor living spaces for cooking, relaxing and entertaining. Use it to finish and protect the area surrounding an outdoor grill or fireplace, or for retaining walls around planting beds, pool decks and other outdoor elements. Moonlight Basin Ledge Stone works on indoor fireplace surrounds just as well. Extend this material right to the ceiling for added height. Its subtle color palette is easy on the eyes without ever being boring. Other popular interior design treatments include dramatic feature walls, spa-like shower enclosures, or as dynamic accents in transitional spaces such as front foyers or hallways. 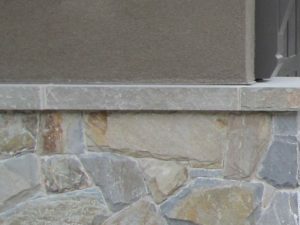 For a more sophisticated take on natural organic stone work, Moonlight Basin Ledge Stone veneer is a material that builders, designers and DIY renovators all love for new builds and existing properties. Solid yet graceful, it's easy to see why.